2017 event dates and ticket on-sale information for the World’s Loudest Month festival series have been announced. The World’s Loudest Month--created by AEG Live and Danny Wimmer Presents--continues to break records with its U.S. festival series featuring the biggest names in rock music performing in eight distinct U.S. concert atmospheres during six consecutive weekends in April, May and June of 2017. In 2016, overall attendance surpassed 470,000 for the WLM festivals held during five consecutive weekends. Monster Energy Welcome To Rockville is Florida’s biggest rock experience, with over 50,000 in attendance at last year’s SOLD OUT event at Jacksonville's scenic Metropolitan Park along the St. Johns River. The 2017 Monster Energy Welcome To Rockville festival will take place on April 29–30 and will feature performances from today’s top artists, and a variety of unique activations and secondary entertainment options including Jack Daniel’s Whiskey Row, The Music Experience, and artist signings, along with art installations, incredible food offerings, wine tastings, and other onsite experiences. The full Monster Energy Welcome To Rockville festival experience will be announced Monday, December 5 at Noon EST. Specially priced tickets as well hotel and VIP packages will be available on Tuesday, December 6. Fans are encouraged to buy early and save. Monster Energy Fort Rock returns for two days in 2017 at JetBlue Park for its fifth year anniversary after selling out last year’s event. South Florida’s biggest rock n’ roll getaway will take place on April 29–30. Monster Energy Fort Rock's lineup will be announced Monday, December 5 at Noon EST. Specially priced tickets as well as VIP packages will be available on Tuesday, December 6. Hotels will be available via the Curadora link found on the Monster Energy Fort Rock website. Fans are encouraged to buy early and save. Monster Energy Carolina Rebellion had another record breaking year in 2016 after growing to three full days. Over 90,000 fans attended Monster Energy Carolina Rebellion, checking out the best of today’s rock--along with legendary classic artists--playing on four stages, a world-class BBQ village, and top notch camping facilities. Layaway tickets will be available on Monday, November 21 at 10:00 AM EST, and the lineup for Monster Energy Carolina Rebellion will be announced this December. Northern Invasion continues to rock Somerset, WI after expanding to two full days last year, and hosting over 45,000 fans. The festival plays host to the biggest rock bands for over twelve hours each day on three stages, and offers a top tier campground experience. Layaway tickets will be available on Monday, November 21 at 10:00 AM CST and the lineup for Northern Invasion will be announced this December. Rock On The Range Layaway tickets, VIP and Hotel Packages go on sale Monday, November 21 at 10:00 AM EST at www.RockOnTheRange.com. Lineup coming soon! Ticket renewals for Rocklahoma 2017 are available starting tomorrow, November 15 at 9:00 AM CST. All 2016 ticket purchasers will receive an email with renewal details. Lineup coming in early 2017! The growth of San Antonio's Bud Light River City Rockfest located at the AT&T Center continues to prove that the city is a rock destination for artists and fans alike. River City Rockfest sold out for its fourth consecutive year with new record numbers of over 27,500 in attendance. Lineup, ticket and on sale information for The Bud Light River City Rockfest will be announced soon! Rockfest--a Kansas City tradition--had 50,000 in attendance in 2016 for America's largest one-day music festival. 2017 marks the 25th year of Rockfest, known as THE rock & roll event of the Midwest, with three stages and 12 hours of hard-hitting music. 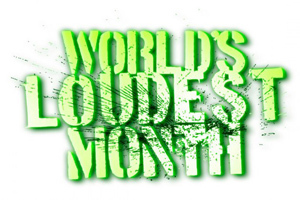 The World’s Loudest Month is proudly sponsored by Monster Energy.